The primary goal of this layer is to take care of the syntax and semantics of the information exchanged between two communicating systems. Presentation layer takes care that the data is sent in such a way that the receiver will understand the information(data) and will be able to use the data. Languages(syntax) can be different of the two communicating systems. Under this condition presentation layer plays a role translator. In order to make it possible for computers with different data representations to communicate, the data structures to be exchanged can be defined in an abstract way. 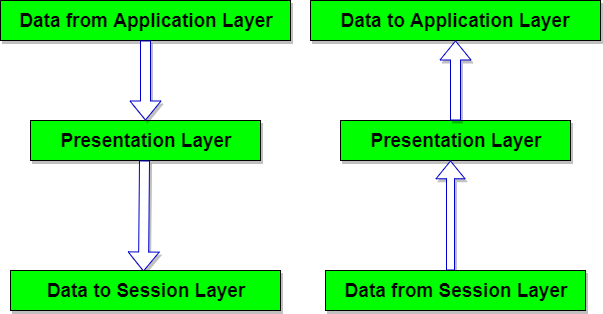 The presentation layer manages these abstract data structures and allows higher-level data structures(eg: banking records), to be defined and exchanged. Translation: Before being transmitted, information in the form of characters and numbers should be changed to bit streams. The presentation layer is responsible for interoperability between encoding methods as different computers use different encoding methods. It translates data between the formats the network requires and the format the computer. Encryption: It carries out encryption at the transmitter and decryption at the receiver. Compression: It carries out data compression to reduce the bandwidth of the data to be transmitted. The primary role of Data compression is to reduce the number of bits to be 0transmitted. It is important in transmitting multimedia such as audio, video, text etc. To manage and maintain the Syntax and Semantics of the information transmitted. Encoding data in a standard agreed upon way. Eg: String, double, date, etc. Perform Standard Encoding on wire.